A veteran Australian rules football broadcaster has apologised after laughing at an amputee's attempts to toss a coin before a match. 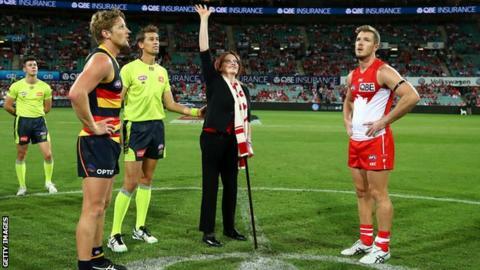 Sydney Swans ambassador Cynthia Banham appeared to struggle while performing the ceremonial role before Swans' AFL match against Adelaide Crows. Eddie McGuire joked on air that people tossing the coin should practise. "The comments show not only a lack of empathy, but also ignorance," a Swans statement said. Academic and journalist Banham had both her legs amputated after a plane crash in Indonesia in 2007. She was performing the pre-match coin toss - used to decide which team kicks off towards which end - while using her walking stick. McGuire, presenting coverage for Fox Footy, provoked laughter from his co-commentators as he said: "I think we should introduce a $5,000 fine to anybody who's tossing the coin and can't do it properly. "Every week, we have someone dropping it on their foot. Come on, toss it up properly, for goodness sake. Practise in the week, you know you're going to do it. It can't be that hard can it, guys?" The comments drew criticism from disability campaigners and on social media. "The Sydney Swans are incredibly disappointed by inappropriate comments made tonight by Eddie McGuire," the Swans statement added. Fox Footy parent company Fox Sports said the comments were "disappointing" and apologised. McGuire, who has withdrawn from covering a game on Saturday, later apologised on air and issued a statement in which he said he was "deeply sorry and regretful for the comments I made last night about the coin tossing system". "I should never have spoken without properly viewing the footage. "I unreservedly apologise to Cynthia, her family and the Sydney Football Club for the pain and hurt that my comments have caused."